dblquad: Compute a double integral. nquad: Integration over multiple variables. Each of the Python functions can be called to evaluate the integrals of either a function entered as a string on the spreadsheet (py_DblQuadS, py_TplQuadS, or py_NQuadS), or a Python function (py_DblQuadF, py_TplQuadF, or py_NQuadF). For the dblquad and tplquad functions, the variables must be x, y, and z, which are passed in the order z, y, x. For the nquad functions the variable names are an input argument, and they are passed in the order listed. Where one or both limits for the nquad functions is a formula the limits are entered in one cell in the format: [lower limit or function, upper limit or function]. See examples in the screenshots. 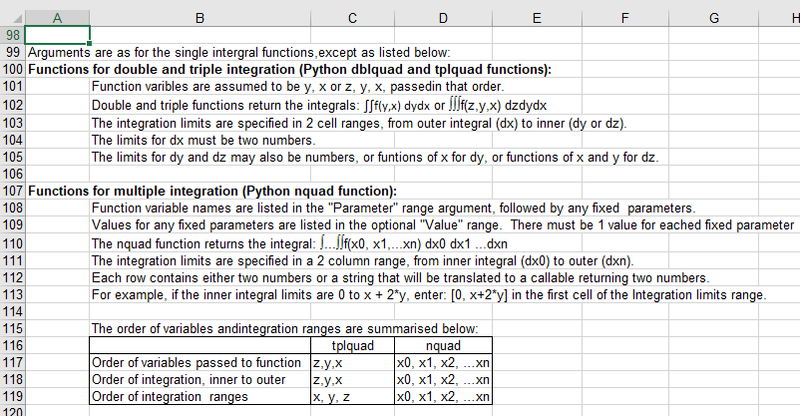 A Pyxll based Excel-Scipy application including these functions, and many others, will be published in the near future. This entry was posted in Excel, Link to Python, Maths, Newton, Numerical integration, NumPy and SciPy, PyXLL, UDFs and tagged Excel, multiple integration, Python, PyXLL, SciPy, UDFs. Bookmark the permalink. The code I used is “just” a wrapper as well, using the C API in the case of Pyxll. The functions can be called without any additional coding, just like a built-in function. You can give all the arguments descriptive names. You can add argument descriptions, that will appear in the function wizard. You can set up the data entry in the most convenient way for the particular data types and format required. You can assign the functions to appropriate categories. aha. I think you’ve commented on my blog. Speaking as blogger to blogger I think yours is much prettier, I should have picked WordPress. I’ve been meaning to add your blog to my blog roll. Do you know of a way to step through Python code that is called from Excel?. Is it possible to put breakpoints in the Python code then recalc a sheet and have the code stop on the breakpoint? That would be a great feature. Both Pyxll and xlwings have this feature. I used the Visual Studio Code editor, with the add-in mentioned in the article. I haven’t done much with xlwings debugging. I found it pretty clunky, but that may well be because of the editor I was using (Pycharm), which I’m not familiar with, and didn’t much like.